Our Get Onside Programme works over 8-weeks introducing rugby to young offenders who have never, or rarely, played the sport before and build towards a full contact game against an external team. 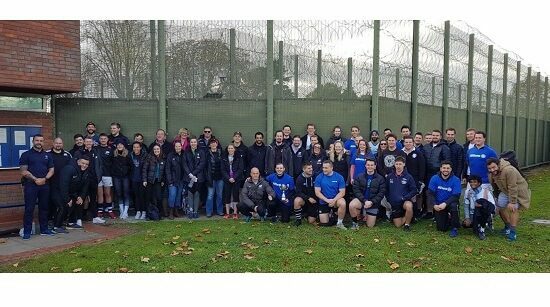 Along the way, participants manage and run a Touch Rugby tournament with some of Saracens’ corporate partners and office staff. They engage and work with mentors, as well as completing classroom sessions focussing on the values and life skills that can be drawn from rugby like conflict management, positive reaction to pressure and controlling aggression. Each cycle, the touch tournament gets bigger and better and this time with 8 teams taking part the atmosphere was buzzing. The programme participants organised and refereed the tournament fantastically and, for some of the teams, were the stand out players. Teams from the Saracens Office, the Foundation, Premier Team Promotions, Allianz, CME Group and BNP Paribas were all vying for the coveted Get Onside Touch Tournament Trophy. The tournament was a tight-run affair. After the pool stages, the Foundation and an Allianz team were tied at the top of Pool A, resulting in an inaugural kicking challenge to decide which team would take part in the final. The Foundation eventually won and found themselves in the final against a very competitive Premier Team Promotions team. The grudge match was intense with PTP taking an early lead of 3-1. However, the Foundation fight back was on and the match was tied at 3-3 with a minute to play. The sound of Foundation hearts audibly breaking rang around the sidelines when PTP crossed the line with 30 seconds to go, finishing with a 4-3 win, breaking a 3-time Foundation winning streak. The Get Onside programme works to reduce reoffending rates and equip the graduates with essential life skills to face the challenges they face both inside prison and upon their release. The current national average for reoffending is around 70% but the Get Onside Graduate reoffending rate is 15%.